The Water Resource Inventory Area (WRIA) 7 Routine Streams Monitoring Program was established in 2011 and consists of twelve sampling sites that are distributed throughout the Snoqualmie and Skykomish watersheds. Historically in King County, routine streams monitoring has been centered on WRIA 8 (Lake Washington/Cedar/Sammamish) and WRIA 9 (Green-Duwamish). However, in 2011 a Surface Water Management (SWM) fee increase allowed King County to expand its regular water quality monitoring efforts to include the King County portions of the WRIA 7 drainage. Objectives of this program are focused on quantifying long-term water quality trends to help inform the management of salmon recovery efforts, land use regulation, and to prepare for expected increases in climate variability. King County collects monthly water quality samples on the Tolt River between its mouth and the Tolt Ave Bridge near the town of Carnation. King County is not currently conducting benthic macroinvertebrate or stream sediment monitoring in the WRIA 7 Routine Streams Monitoring Program. The Tolt River sub-basin is one of the largest in the watershed. At 61,500 acres, it is larger than the South Fork Snoqualmie and roughly the same size as the North Fork Snoqualmie. The subbasin is significant and unique on a number of fronts. The South Fork Tolt reservoir is a core component of the regional water supply system. The geology of the basin - combined with historical and current forestry practices - have resulted in a history of landslides and erosion, with likely impacts on turbidity, particularly during high flows (Kaje, 2009). Total land use in the Tolt River sub-basin is predominantly forest and over half of the forest is evergreen. The next largest land use is scrub. Developed, agriculture, and wetlands are very small portions of the sub-basin that amount to less of total land use combined than other (barren land, grassland, and open water). See Table 1 below for more details on land use. The Tolt River basin is one of the most significant spawning areas for Snoqualmie Chinook salmon and for other salmonids. The Tolt River is also home to the only known naturally occurring spawning population of summer steelhead in the basin. State water quality standards were revised in 2003. The Tolt River is now categorized as “Core Summer Salmonid Habitat” for aquatic life use and “Primary Contact” for recreational use. As part of the updated water quality standards, the Tolt River has been assigned an additional “Supplemental Spawning and Incubation Protection” temperature criteria of 13 ºC to be applied from September 15th to June 15th. A short reach of the Tolt River near its mouth is listed on the Washington State Department of Ecology's (Ecology) 303(d) list as a "waters of concern" (Category 2) for pH, though no major violations of have been observed on the Tolt River. The river has an EPA-approved Snoqualmie River Watershed Temperature total maximum daily load (TMDL) plan in place and implemented (Category 4a). A Water Quality Index (WQI) rating system was developed by Ecology that evaluates several water quality parameters and gives a single rating of “high,” “moderate,” or “low” water quality concern. To see how Tolt River ratings compare with other stream sites, please visit the Water Quality Index webpage. The U.S. Geological Survey (USGS) also operates several stream gages within the Tolt River basin. Station 12148500 is located just downstream of the confluence of the North and South Forks. Station 12147500 is located on the North Fork of the Tolt near the regulating basin. Station 12148300 is located on the South Fork near the regulating basin. Station 12148000 is just downsteam of the South Fork Tolt Reservoir and station 12147600 is located upstream of the reservoir. 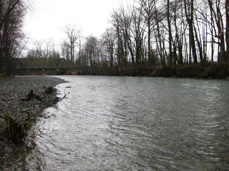 While King County is not conducting benthic macroinvertebrate monitoring on the Tolt River as part of the WRIA 7 Routine Streams Monitoring, King County collected benthic data from two tributaries of the Tolt, Lynch and Stossel Creeks, in 2006. To see this data, please visit the Puget Sound Stream Benthos webpage.